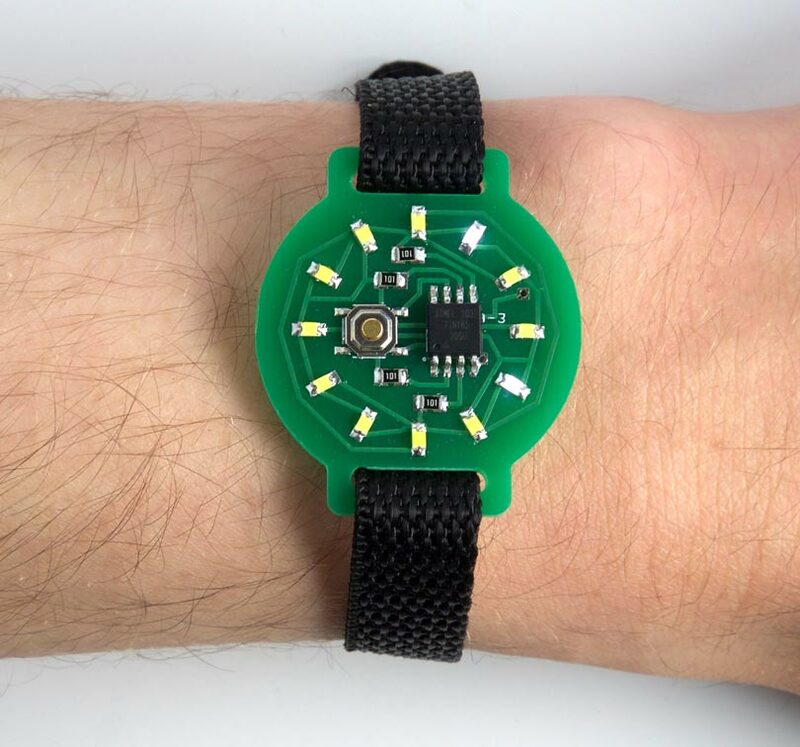 The ATtiny85-based Time Time watch; it's five past four. To show the time you press the button on the watch face, and the time is then displayed for four seconds. It lights one LED to show the hour, and flashes another LED to show the minutes to the nearest five minutes, like the hour and minute hands on a clock. If only one LED lights up you know that both hands are pointing to the same hour mark. The Tiny Time watch uses the ATtiny85's built-in oscillator, fine-tuned to get it as accurate as possible, and my watch keeps time to within a couple of minutes over 24 hours. You can adjust the time by holding down the button for more than four seconds. It's powered by a CR2032 button cell, and I've used several techniques to reduce the current consumption, so the battery should last for over a month. The total component cost, excluding the PCB, is about £5/$5, and it's straightforward to build. For an improved version of this project see Tiny Time 2 Watch. I was inspired to design this watch after reading about Sam DeRose's Nerd Watch  which takes minimalism one step further. It seems fortuitous that you can drive 12 LEDs from four I/O lines using charlieplexing, exactly the number you need to display a clock face, taking advantage of the fact that you can drive two LEDs from every different pair of the I/O lines. One more I/O line is needed to detect the button press, neatly using the five I/O lines available on the ATtiny85. Circuit of the ATtiny85-based Time Time watch. The button is a miniature SMD pushbutton available from Sparkfun , available from Proto-PIC in the UK , and the battery holder is an SMD 20mm coin cell holder also available from Sparkfun , or from Proto-PIC in the UK . The LEDs are 0805 size, and I chose white LEDs as they tend to be the brightest. I got mine from Bright Components in the UK, who sell them for under £1 for ten . The LEDs should be soldered with the same orientation, with the negative sides facing the centre of the board. There's a link to the Eagle files at the end of the article if you want to make yourself a board. Alternatively, because the track layout avoids vias you could use a single-sided board, milled using a milling machine such as the Othermill ; you could then glue the battery holder to the other side, and connect it through two holes to the main circuit. The 12 LEDs are driven by the four I/O lines PB0, PB1, PB3, and PB4. PB2 is used for the push button, because it is assigned to the interrupt INT0, which makes detecting the button a bit easier. The first row of the array specifies which LEDs have their cathodes connected to PB0: the LED at 10 o'clock has its anode connected to PB1, the LED at 2 o'clock has its anode connected to PB3, and the LED at 12 o'clock has its anode connected to PB4. The values in the array corresponding to PB2 are set to -1. First it increments the seconds counter, Secs, every 250 calls. Then, if the display has been turned on, it calls DisplayNextRow() to display the next row of LEDs. Finally, it counts down the variable Timeout to blank the display automatically four seconds after the button has been pressed. If the button is held down for more than four seconds the time starts advancing 5 minutes every half second, to allow you to set the correct time, until you release the button. Up to two LEDs can be lit at once. The LED specified by the variable Hours is used to show the hours, and is displayed continuously. The LED specified by the variable Fivemins is used for the minutes, and flashes every 32 times the routine is called. The bottom two bits of the variable Cycle determine which row is being displayed. For a given row the array Pins[row][i] is checked to see if any of the LEDs in that row need to be displayed or flashed. If so, the appropriate bits are set in the variable bits. This is then written to the port. I decided that since the watch only shows you the time to within five minutes, it should round up the time to the next five minute mark, so you are early rather than late for appointments! The correction +299 in the calculation of Fivemins achieves this. My first version of the watch program displayed the hour number as a continuously illuminated light and the five minute mark as a flashing light, but for times after half past the hour this gave a confusing display. For example, for 2:50 the watch would light the 2 and 10 LEDs, but one's instinct is to read this as ten to two; ie 1:50. The current version therefore displays times later than half past the hour by lighting the next hour number, which gives a more familiar display. This is implemented with the correction +1799 in the calculation of Hours. I was keen to make the watch last as long as possible on a single battery. Because the internal oscillator is used to keep the time it's not possible to save power by putting the processor to sleep, and the watchdog timer isn't accurate enough for timekeeping. I therefore investigated other ways of saving power. If you inadvertently reduce the system clock below 500kHz you will not be able to reprogram the chip using ISP (In-System Programming), because the processor isn't running fast enough to execute the instructions to clear the flash memory. I therefore included a 5 second delay before reducing the clock speed; if ISP fails, reset the processor and try again within 5 seconds, and it should then work. The final current consumption is about 0.36mA at 5V, dropping to 0.23mA at 3V. A typical CR2032 battery has a capacity of 225mAH, so it should last over a month. I compiled the program using Spence Konde's excellent new ATTiny Core, which now supports all the ATtiny processors and supersedes the various earlier ATtiny cores . Select the ATtinyx5 series option under the ATtiny Universal heading on the Boards menu. Then choose Timer 1 Clock: CPU, B.O.D. Disabled, ATtiny85, 1 MHz (internal) from the subsequent menus. This is the default fuse setting on new ATtiny85s; otherwise choose Burn Bootloader to set the fuses appropriately. I uploaded the program using a clip that fitted to the top of the SMD ATtiny85 , using Sparkfun's AVR Pocket Programmer . The advantage of this over the Tiny AVR Programmer Board that I usually use is that it allows you to program a circuit while it's powered by its own supply, so I don't have to remove the button cell from the Tiny Time watch. To avoid the need for a crystal, and the two additional I/O pins that would need, the watch uses the ATtiny85 internal oscillator for its timekeeping. The internal oscillator isn't as accurate as a crystal, but I included the ability to fine-tune it, to get the watch as accurate as possible. Power the watch from a CR2032 battery, as the oscillator is affected by the supply voltage. Run the following program to generate a frequency on the PB0 pin. Measure the frequency with a frequency meter, and recompile the test program with different values of OCR0A. Adjust the value until you get the frequency as close as possible to 1000Hz. Copy the OCR0A value to the setup() routine in the Tiny Time Watch program. I found it took me just a few minutes to get the frequency within better than 1Hz of 1000Hz. If you don't have a frequency meter you could run the watch for a few hours, and then from the time error calculate the adjustment you need to make. Here's the whole Tiny Time Watch program: Tiny Time Watch Program. Alternatively, get it on GitHub here together with the Eagle files for the PCB: Tiny Time Watch on GitHub. I have some spare PCBs for the Tiny Time Watch which I'll send to the first eight people who email me - see the Contact me link to the right. I'll remove this notice when all the boards have gone. ^ The Nerd Watch on the Other Machine Co. website. ^ Mini Pushbutton Switch - SMD on SparkFun. ^ OSH Park PCB service. ^ Pocket AVR Programmer on Sparkfun.